While this may look challenging, it’s actually a pretty easy dessert to assemble and is sure to wow your guests (as well as yourself!). It’s also an ideal get-ahead dessert. Make the meringue wreath a day before it’s needed and store it in an airtight container. The compote can be made up to three days in advance and kept refrigerated or made even further ahead and frozen. 1. Preheat the oven to 140°C/gas mark 1. Line a large baking sheet with non-stick baking paper and mark out a 25cm circle with a pencil using a plate or pan lid as a template. Flip the paper over so that the pencil marks are facing down. 2. Place the egg whites in an electric mixer and whisk on high for a few minutes, until stiff. Add the sugar 1 tablespoon at a time, whisking for 30 seconds before adding the next spoonful. Continue to whisk until the mixture is really stiff and glossy. 3. Dab a little of the meringue mixture under each corner or the baking paper to stick it to the tray so it doesn’t move. Place 10 large spoonfuls (about 40g) of the meringue on the lined tray, touching each other around the inside edge of the circle to create a wreath. Sprinkle the flaked almonds evenly over the meringue. 4. Bake for 1 hour 15 minutes, until lightly golden and crisp. Turn the oven off and leave the meringue wreath in the oven until it’s completely cool before removing. 5. Meanwhile, to make the compote, place the cranberries, maple syrup, orange zest and juice and star anise in a saucepan and bring to the boil. Reduce the heat and simmer for 5 to 6 minutes. As the cranberries begin to soften and pop, crush them lightly with a masher or the back of a spoon. Once the compote begins to thicken to a jam-like consistency, remove from the heat and leave to cool completely, then discard the star anise. 6. When ready to serve, softly whip the cream in a large bowl. 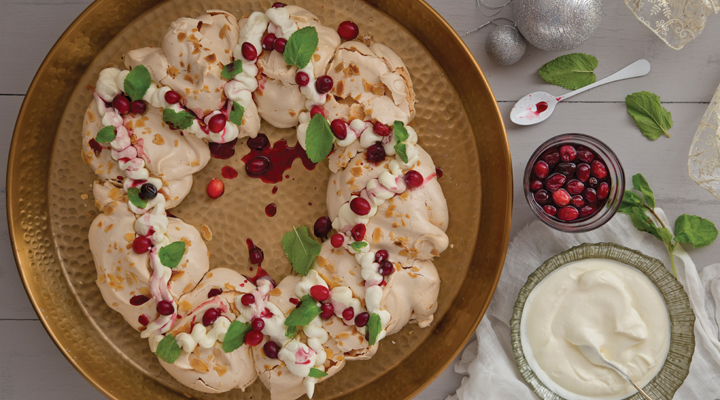 Carefully slide the meringue wreath onto a serving platter or cake stand. Spoon the cream over, then the cranberry compote on top. Decorate with the fresh mint and serve. Tip: Chopped hazelnuts, pecans or macadamias would work just as well in place of the almonds if liked.